To Cite: Moghtadaei M, Moghimi J, Shahhoseini G. Distal Femur Morphology of Iranian Population and Correlation With Current Prostheses, Iran Red Crescent Med J. 2016 ; 18(2):e21818. doi: 10.5812/ircmj.21818. Background: Maintaining proper size and rotation of components of total knee arthroplasty is mandatory for optimal longevity. Ethnical differences may affect the fitness of prostheses that were manufactured mainly based on Caucasian dimensions. Objectives: To evaluate the distal femur morphology of the Iranian population at the level of standard cuts simulated via computed tomography. Patients and Methods: During 2013, 150 consecutive patients (96 males and 54 females) from the outpatient Department of Orthopedic Surgery of Rasoul Akram Hospital with knee CT scans were studied. We entered cases with apparent normal extremity alignment and bone maturity. Exclusion criteria were history of fracture or conditions affecting knee profile. Standard cuts were simulated on the CT scan using the Marco Pacs program. For each bone, anteroposterior (AP), mediolateral (ML), and aspect ratio (ML/AP) were measured. Values were compared with the sizing of four currently available prostheses. Results: The mean age of the patients was 43 years (range: 17 to 80). All isolated parameters were higher in men significantly (P < 0.001). However, the aspect ratio did not show any significant difference (1.51 ± 0.11 vs 1.46 ± 0.1), suggestive of a similar configuration of distal femur profiles between genders. Ultimately, close correlations were observed among simulated cuts and size-matched femoral components of the prostheses. For females, however, components were mostly overhang mediolaterally except for one gender-specific subset. Decrement in the aspect ratio for larger knees was another mismatch with current prostheses that preserve an almost constant ratio throughout all sizes. Conclusions: Our findings may be applied by manufacturers to design prostheses more compatible with Asian populations. Alterations to the shape of components should be considered to provide optimal coverage. Total knee arthroplasty (TKA) is a highly complex and accurate procedure that aims to relieve pain and improve function. To achieve this, it is critical to select a prosthesis that best fits the sizes of the resected surfaces of the distal femur and proximal tibia. Any mismatch or malposition may result in a number of severe complications, such as soft tissue imbalance, impaired movement, and implant loosening (1, 2). Prosthetic components currently available on the market are mainly designed based on the Caucasian population. Asian ethnicities are supposed to have smaller knees in accordance with their smaller statures (3-5). Therefore, modification of current prostheses may be necessary to fulfill the requirements of these anthropometrically smaller ethnic groups (4, 6-9). Moreover, differences between male and female sizing and the necessity of gender-specific prostheses have been an issue of debate (10-12). Recently, some studies have focused on more detailed points such as designing an asymmetrical tibial baseplate for a better fit (6, 7, 13, 14). Anthropometric characteristics of the knee joint from many Asian countries are presently available mainly from Asian-Pacific countries (4-9, 15). Some significant criticism can be made regarding the studies’ different methodologies, which make comparing the results difficult. To our knowledge, such surveys were rarely performed in Middle Eastern countries. We conducted this study to evaluate distal femur morphometrical characteristics of the Iranian ethnicity based on CT imaging. 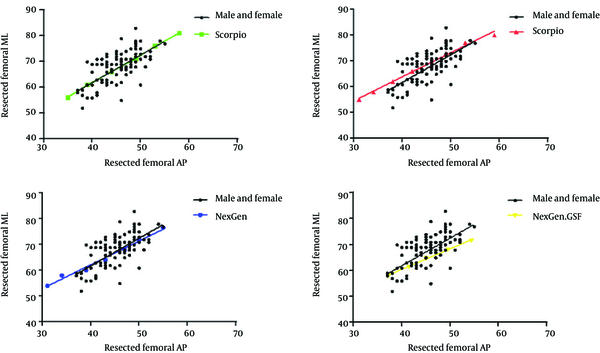 Furthermore, correlation to three available prostheses (NEXGEN, Scorpio, and GENESIS) and consistency to one of the gender-specific femoral components (GENESIS-GSF) were assessed. We also tried to examine the symmetry of the proximal tibia based on simulated cuts. During 2013, a descriptive study was conducted at the outpatient Department of Orthopedic Surgery of Rasoul Akram Hospital in Tehran, Iran. This large university teaching hospital is a referral center that covers patients of diverse ethnic groups from various socioeconomic strata. The subjects were selected retrospectively from patients referred to the emergency department or the orthopedic office of the hospital who needed to undergo a knee CT scan, usually due to trauma. After surfing in the digital database of radiographic information, qualified subjects were recruited and the complementary information was gathered along with a complete evaluation of their knee CT scans. Based on consultation with a statistician and a review of previous literatures, an acceptable number of 150 was set to gain a power of 80% and α < 0.05. The selection criteria were being of mature age and having normal apparent lower limb alignment. Patients with severe osteoarthritis, any rheumatoid condition, gross congenital anomaly or deformity, or concomitant hip or spine deformities were excluded from the study. After calling up the subjects, they were examined completely to be sure they met the mentioned criteria. From about 600 cases with knee CT scans available in our imaging database, we selected qualified ones until we reached the determined sample size. Informed consents were obtained from all participants of the study and the study proposal was approved by the institutional review board of Iran University of Medical Sciences (IUMS). A computerized tomography (CT) scan of the knee was obtained using a helical CT scanner with a 1 to 3 millimeters slice thickness. Patients were instructed to relax in a supine position with both lower limbs in extension and neutral rotation (i.e., with patellae parallel to the ceiling). Using scout views, the scan direction was aligned to be in the plane perpendicular to the mechanical axis of the tibia in the frontal plane. The data were reconstructed in three conventional planes using the MarcoPacs program. This program was installed in the hospital radiologic database and a uniform method was used to measure each parameter by an orthopedist. Cut simulations were performed as described below. A line perpendicular to the mechanical axis of the femur at the level of 9 mm from the joint line was drawn to simulate a distal cut. The anterior simulated femoral AP cut was made with a line drawn along the anterior cortex of the distal femoral condyle. To perform the posterior femoral AP cut, we followed the method described by Ho et al. and Urabe et al. that was applied in some similar surveys: the cutting line was set corresponding to 10 mm on the medial condyle and 8 mm on the lateral condyle from most posterior points of each condyle (5, 16). The widths of the medial and lateral femoral condyles and intercondylar notch at the level of the posterior cut were also measured and the sum of them was assigned as the mediolateral (ML) value. For anteroposterior (AP) dimensions, we measured both the resected AP and non-resected lateral condyle AP that were perpendicular to the transepicondylar axis. Either of these values was applied in similar studies and we believed that this would improve comparability among studies. The SPSS and GraphPad Prism 6 software were used for statistical analysis. Descriptive statistics was used for both demographics and bone dimension measurements. Comparative statistical analyses between genders were made using the t-test. A correlation analysis was performed to compare the simulated resected bones with size-matched components of total knee prosthetic systems. In analyzing the morphometrical data, scatter plots along with a best-fit line were presented. A total of 150 patients were surveyed, comprising 96 males (64%) and 54 females (36%) aged 17 to 80 years. No statistical difference was observed among ages between genders (P = 0.063). The demographic data are shown in Table 1. Measurements were performed after the simulation of the distal femur cut at the standard level (Table 2). The mean values were 44.9 ± 4.1 mm for the resected AP length (ranging 37 - 55) and 67.06 ± 6.39 mm for the resected ML width (ranging 58 - 89). The mean for the lateral condyle AP was 60.82 ± 3.9 mm. 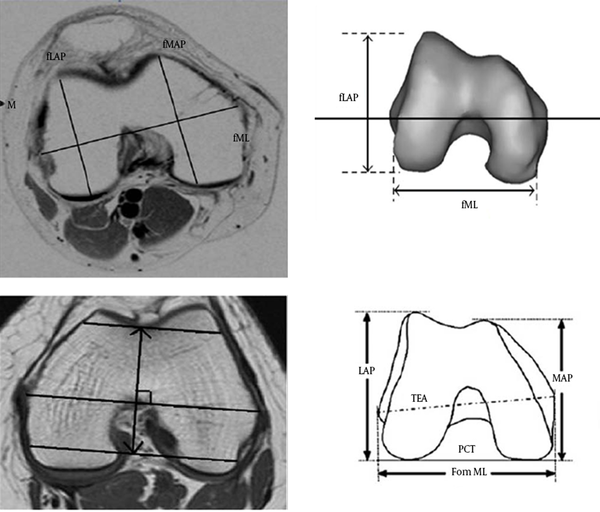 All isolated parameters of the Iranian femur dimensions were higher in men significantly (P < 0.001). However, the aspect ratio did not show any significant difference (P = 0.069). For all cases, close correlations were observed between the simulated resected distal femur and the size-matched femoral components of the Scorpio and NexGen systems. However, the Genesis II had a larger ML width (i.e., overhang) compared to Iranian subjects in the smaller AP sizes (Figure 1). Further analyses between genders revealed that all of the standard components were overhung for females (Figure 2). This gap was progressive as the AP values rose. Interestingly, the females’ correlation line best fit with the sizing of the NexGen-GSF. On the other hand, for males, almost all of the designed sizes of prostheses in the smaller AP sizes were undersized. The femoral aspect ratio for the simulated cuts showed a higher ratio for smaller knees and a lower ratio for larger knees (Figure 3). Again, the females’ aspect ratio was best fit to the NexGen-GSF components. Besides precise surgical techniques in TKA, proper sizing of the prosthesis is mandatory for a successful and long-life outcome (1). Any mismatch in the form of overhanging or undersizing of the components can lead to altered soft-tissue tensioning and impaired patellofemoral tracking. In order to enhance the quality of the fitness yielded by prostheses, anthropometric and morphometric studies from diverse ethnicities are mandatory. Some surveys demonstrated that Asian populations have smaller knees compared to Caucasians (2-4). This has posed the need for alterations in the sizing and configuration of current prostheses to best fit different ethnicities. To our knowledge, anthropometric surveys from China, Korea, Japan, India, Malaysia, and Thailand have been conducted to construct an Asian knee profile (4-9, 15-17). There were delicate discrepancies in the methodology and results of these studies, which can affect the outcome of TKA and should be considered while comparing their findings. To avoid misinterpretation, it should be first delineated from what stance we are viewing the results: whether clinically or anatomically. For example, a glance at an anatomical study conducted by Mahfouz et al. shows that they defined most of their anthropometrical parameters (e.g. femoral condyles AP) based on the longest length of the parameter (3). However, in clinical studies like most of the works related to arthroplasty, the same parameters were defined based on some other considerations (e.g. AP is settled perpendicular to trans-epicondylar axis (TEA)). Thus, with different condylar angulations in the axial plane, different anatomical AP dimensions may be expected with the same clinical AP. As shown by Mahfouz et al., the TEA is very similar in the different major ethnical categories of African American, Caucasian, and East Asian (84.9, 85.9, and 85.4 mm). This parameter was calculated as the ML dimension with the common definition among the anatomical and some of the clinical surveys. However, one should notice that the femur ML can be better demarcated at the level of condyles (instead of epicondyles) if the results are to be correlated with arthroplasty. On the other hand, within the same population of either Caucasian or Asian, sometimes all of the available studies are not fully scrutinized before a conclusion is reached. We evaluated knee dimensions corresponding to standard cuts of the distal femur during TKA. Based on our findings, morphological parameters were significantly larger in males compared to females. However, aspect ratios did not show such difference. It can be inferred that the shape configuration of resected cuts seemed to be maintained with knee enlargement. These ratios were reported to be different among genders in some studies (7, 8, 11, 15). Distribution of the measured values depicted that for a given AP size there is variety of ML sizes. This discrepancy was also a matter of concern in other populations (7, 9, 17). To overcome probable mismatches, the availability of at least two ML sizes for the same AP size of a prosthesis is proposed to provide better coverage. On the femoral side, close correlations were totally observed between the simulated resected cuts and the size-matched femoral components of the Scorpio and NexGen systems. However, all selected prostheses were shown to be oversized for Iranian males, who had smaller knees. Gender-specific components, although mostly designed based on Caucasian dimensions, are a surprisingly good fit for the females of this population. This was supported by other reports on Asian morphology (10). As mentioned before, two definitions were applied for the femoral ML value: lines parallel to TEA at the level of epicondyles or at the level of TKA cuts on the femoral condyles. This appeared to create a discrepancy of nearly 10 mm as can be demonstrated by the values reported from the Chinese populations that used both methods (15, 18). We support the findings of Mahfouz et al. regarding the similarity of ML dimensions among Asian and Caucasian ethnicities (3). For the femoral AP, several methods were also applied for measurement: the longest lateral condyle AP, resected AP perpendicular to TEA, and even medial condyle AP (Figure 4). The latter as described in Indians may have resulted in an underestimation compared to the more commonly used lateral condyle AP. Resected cuts showed the lowest values. After considering the diversity, it seems that the AP profile of Asians is smaller than that of Caucasians. As a result of a relatively similar ML value and a smaller AP dimension, Asians have a higher aspect ratio. This is supported by the findings of Mahfouz et al. and justifies the observed mismatch of femoral components especially in regards to the smaller knee sizes of Asians. A limitation of our analysis is the relatively young age of the selected sample. The results may be more approximate to normal morphology rather than osteoarthritic knees. Further studies are advised to cover cuts with different depths and combine imaging measurements with corresponding surgical results. Other confounding factors such as age, height, severity of osteoarthritis, and lower extremity alignment should also be adjusted. We tried to evaluate anthropometric data of Iranian population in order to improve current designs of TKA prostheses. Data from mismatches between sizes and shapes (aspect ratio) of the components may be taken into account by manufacturing companies. Females of our population will definitely benefit from more modified gender-specific prostheses. This was the first study to evaluate such morphologic parameters in Iranian population. Measurement repetition would have improved the inter- and intra-observer reliability of our results. However, as an anthropometric study, conducting similar surveys in more diverse Iranian ethnical samples would make the study more comprehensive and practical, and future studies should take this into account. We would like to express our thanks to the radiology staff of Rasoul Akram Hospital for their cooperation. Authors’ Contribution: Mehdi Moghtadaei and Javad Moghimi were involved in almost all parts of the study from the design to writing the manuscript; Gholamreza Shahhoseini, as senior professor of our department, helped with the study concept and design, technical support, supervision, and manuscript preparation. Funding/Support: The study was totally funded by academic grants from Tehran University of Medical Sciences and Iran University of Medical Sciences.